Here’s a book I really, really liked. I read it three times, even. 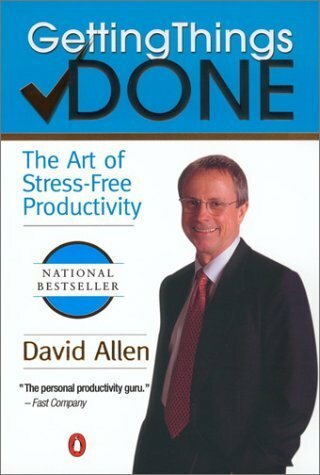 Called “Getting Things Done” by David Allen and it’s basically a workflow management book that bills itself as “stress free productivity”. One of the basic premises of the book is that giant to-do lists are ineffective and ends up being counter-productive over time. This is because the list gets unwieldy and intimidating with time and there is no easy way to harness the information in it. The book argues that one of the reasons people get stressed out so much is that really don’t have a good mental grasp on what is being worked on and, more importantly, what is knowingly NOT being worked on. To sum it up, GTD is basically a collection/implementation system that organizes your to-do’s, events, and objects in your life in such a way where you can can have a better grasp on what is going on. This is done by having a good collection process, breaking up todo items into their own contexts (“at work”, “phone calls”, “out in the field”) and thinking in terms of the “next action level”, not the project level. The “next action” is basically defined as “the next little step to move this project forward”. While this may seems obvious to most, “next actions” are actually (and surprisingly) not done by most people in the real world. People tend to have no concrete notion of what the next step is, they tend to think in larger chunks. “Get oil change in car” is too amorphous. “Calling around and ask what the best deal” is something more concrete. Humans need to get into this habit. GTD is a bottom-up system, rather than a top-down one. 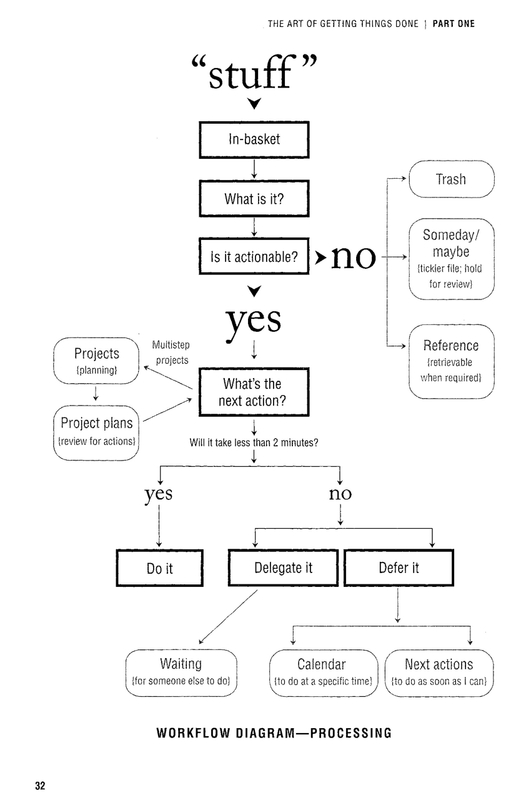 The results of your next action steps determine how you handle the enclosed project. And the results of your projects allow you to re-evaluate your “one level up” areas of responsibility. This creates a system that is adaptive to changing conditions so you can better go with the flow. It eschews formal “big design up-front” planning in favor of informal planning and adaptability. This workflow system helps you understand a) what you have to do, b) what you NOT have to do at this point in time, and 3) how to view the system in a way where prioritizing is obvious. A regular review of the system is one of the key points in the system, and should be done on a weekly basis. Finally, the thing I like about the book was written from a practitioner’s point-of-view, not an academic. It’s a real world system that has been refined over decades. The book is easy to read and avoids academic jargon with lots of insightful tidbits and practical advice. To an entrepreneur who has to wear many hats during the course of his workday, this book is a blessing.